Beer in Thailand really boils down to the three top Thai beer brands: Singha, Leo, and Chang. All three beers enjoy a mostly loyal following made up of locals, travelers, and Western expats who now call Thailand home. Competition in Thailand is fierce—you usually don't have to look far to spot someone in a T-shirt promoting one of the big beer brands. Beer drinkers in Thailand like what they like, and they enjoy arguing the nuances. Many don't realize Leo and Singha are produced by the same company. Beer was originally introduced to Thailand by European visitors, but since 1933, Thais have been brewing their own. Although you can find imported beer at most bars and restaurants, local beers do a great job of controlling the extra kick while enjoying some spicy noodles. Craft beer is trying to take hold in Thailand, however, strict laws and harsh penalties for home-brewing are stifling the industry. In 2016, the laws were made even tougher. Since the regime change, Thailand has been tightening its laws regarding alcohol. Tip: Don't be surprised when your beer in Thailand is served with a glass of ice (nam keng). It's not as bad as it sounds, particularly in the Southeast Asian heat. Local drinking etiquette is to share large bottles; they don't stay cold long. The name "Singha" is derived from singh, the Sanskrit word for "lion" and a powerful beast in Hindu folklore (also why Singapore is known as the "Lion City"). Thailand’s first—and many would argue, best—beer is a clean-and-crisp pale lager at 5 percent ABV. Singha is also the Thai beer most well-known outside of Thailand since it’s exported to many foreign countries. Seems fair as the Boon Rawd Brewery has been producing Singha since 1933. Singha is often slightly more expensive than the other top beer brands in Thailand. Maybe that's why it's more shunned by budget travelers who prefer Leo or Chang. Boon Rawd Brewery (the oldest in Thailand) is headquartered in Bangkok, but beer is produced at a scattering of breweries all across the country. Public tours of the brewery aren't advertised, however, private, group, and corporate tours can be arranged by contacting the company. Pronunciation: "ch-ah-ng" rather than "ch-ae-ng"
Beer Chang (chang is the Thai word for "elephant") may not be as well known in the West as Singha, but it’s immensely popular in Thailand. Chang is especially loved by budget travelers who spend a lot of time socializing: it's usually the cheapest of the top Thai beer brands on offer. Chang has been helping refresh sun-parched travelers since 1995. Many prefer the bold taste over Leo or Singha. 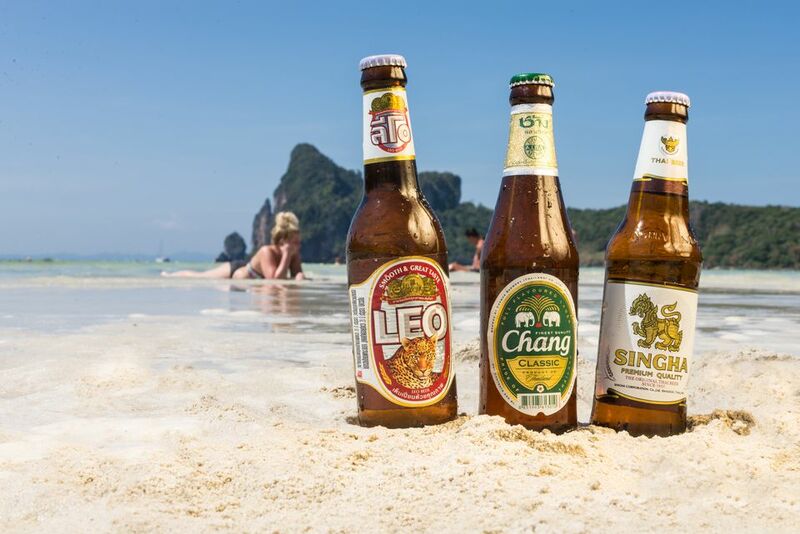 Until 2015, the lager was the strongest of the beer choices in Thailand: the ABV was a harder hitting 6.4 percent. The new Chang Classic has an ABV of 5.2 percent. Although it's won a number of awards, Chang struggled with a reputation of quality control. Rumors ran wild that Chang's ABV was inconsistent between bottles and could reach higher than 10 percent. Rather than overindulgence, the beer recipe was usually considered the culprit. Chang changed the ABV and formula, releasing several variants including Chang Light, Chang Draught, and Chang Export. In 2015, all brands were consolidated into Chang Classic. Chang is produce by Thai Beverage (ThaiBev), the largest beverage company in Thailand. They also make Sangsom and Mekhong, the most popular rums in Thailand. ThaiBev was founded in 2003 and is headquartered in Bangkok, but much of the brewing is done in Ayutthaya, the ancient capital just north of Bangkok. Archa (horse) beer is also produced by the ThaiBev company, however, it's not as well known to travelers. Archa is a popular pick in some expat circles who prefer the taste and 5 percent ABV. Leo, a lager with 5 percent ABV, is one of Thailand's most popular “budget” beers, mostly because it goes down easily and isn't Chang. Once upon a time, Chang had a nasty reputation for giving consistently terrible "Changovers." Travelers turned to Leo which was considered better quality but still inexpensive. Like Singha, it's also made by Boon Rawd Brewery but cost a little less. Yes, the name is another shout-out to a mythological, lion-like beast. Leo has a large share of the market in Thailand, but according to Chang loyalists, lacks the flavor oomph of Chang. Call it the middle contender somewhere between Chang and Singha. Prices vary around the country, but Leo usually costs only a little more than Chang but less than Singha.